Third International Conference: Catalyzing Nursing Education and Scholarship for Global Health - Canadian Association of Schools of Nursing / Association canadienne des écoles de sciences infirmières (CASN / ACESI). 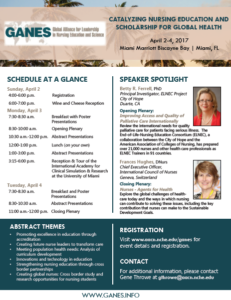 The Global Alliance for Leadership in Nursing Education and Science (GANES) is pleased to announce that it is hosting a two-day global nursing education conference in Miami! The conference program includes an opening reception, keynote speakers, concurrent abstract sessions and poster presentations. See the attached flyer for more information on our exciting plenary speakers Dr. Betty Ferrell and Dr. Frances Hughes!